Through our unique partnership with ARL Bio Pharma, we provide state-of-the-art laboratory services to compounding pharmacies at substantial discounts of up to 20% off standard rates. Through Letco’s Quality Savings Program, you can get discounts on lab services with ARL Bio Pharma. 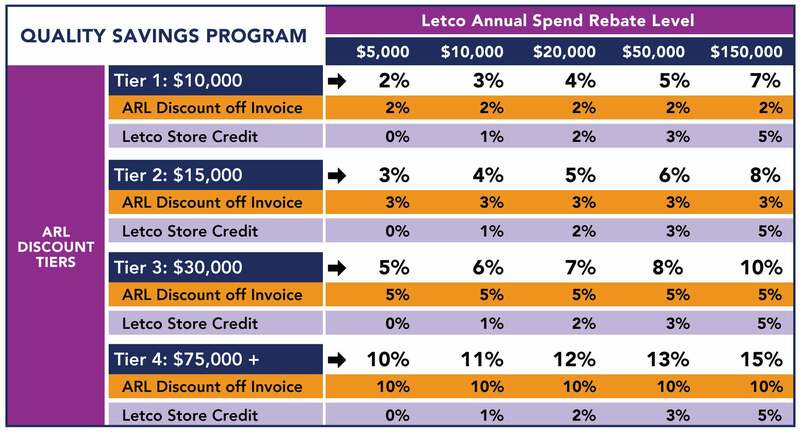 You can unlock even more savings with store credit from Letco based on your lab spend with ARL. Letco and ARL have combined resources to develop the Quality Savings Program (QSP), helping pharmacies take full advantage of compounding as a profit center. Through our partnership, active Letco customers are eligible for discounts on testing conducted by ARL at their state-of-the-art laboratories. Spending at ARL can also qualify customers for store credit from Letco. As our preferred partner for all Letco’s lab service needs, ARL supports the quality commitment we make to our compounding customers every day. Together, Letco and ARL have the expertise and resources to provide fast and cost-efficient formulation support and pharmaceutical analysis, from API sourcing to product testing. You may already be eligible for a discount! Spend at least $5,000 in Letco purchases during a six-month period to qualify for the Tier 1 ARL discount. To become eligible for an additional rebate, spend a minimum of $10,000 with Letco during the calendar year. If you’re eligible, you can retrieve your electronic Eligibility Certificate through our website when logged into your account. Save the Eligibility Certificate and provide it to ARL to enroll in the discount program. Discounts will be applied to your ARL invoices once services have been performed. Your discount level will be reviewed annually and adjusted as needed, based on your projected annual spend. If you qualify for a store credit from Letco, it will be applied to your account in January of each calendar year once we’ve calculated the prior year’s total spend. At Letco, we believe that when professionals in the compounding industry work together, everyone benefits. Our partnership with ARL is an example of great collaboration resulting in a cost advantage for compounding pharmacies, and we are excited to pass these savings on to you. See the terms and conditions of our Quality Savings Program.